Your PD stands for Pupillary Distance, which is the distance between your pupils in millimeters. Your PD is very important for accurately fitting your lenses to achieve visual acuity. Generally speaking, the PD number of adults stays the same. The average PD for adults is 55-75 mm and for kids is about 42-55 mm. A difference of 2-3 mm is allowable. PD (OU), written as "64", means the Binocular PD which is for both eyes. PD (OD), means the Monocular PD for the right eye, PD (OS), means the Monocular PD for the left eye. A Monocular OD is written as two numbers, for example, "32/30", "32" represents the PD for the right eye, and "30" for the left eye. Sometimes PD is written as "62/59" or they are labeled "Far" and "Near". Your PD is usually measured for distance vision, which is 'Far PD", or "62" in this example. 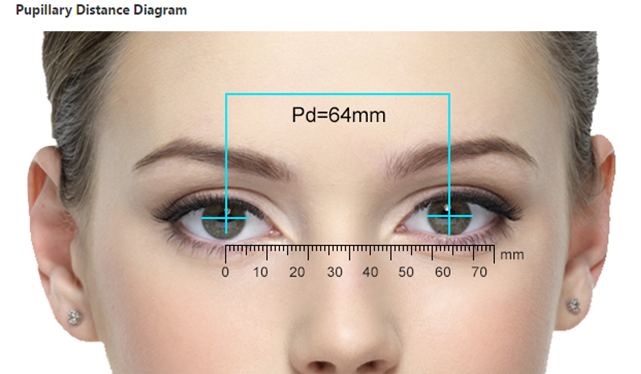 For reading glasses, doctors measure your "Near PD" or "59" in the example. Always enter your "Far PD" for distance vision eyeglasses and enter your 'Near PD" for your reading glasses only. For most people, the difference between Far PD and Near PD is about 2-3mm. PD is very important for accurately fitting your lenses to achieve visual acuity. Generally speaking, the PD number of adults stays the same. The average PD for adults is 55-75 mm and for kids is about 42-55 mm. A difference about 2-3 mm is allowable. Checking with your doctor is recommended. You can also measure it this way. Step 1: Stand with a friend facing you and place a millimeter ruler on the bridge of your nose. Keep the ruler "0" measurement is exactly in line with the center of your left pupil. Hold the ruler straight. Step 2: Let your friend read the measurement between the left pupil and the right pupil while you look straight ahead. Step 3: For measuring a PD with high accuracy, please do it 3 times and take an average number of them as the final PD measurement. For those requiring bifocal or progressive lenses, we strongly recommend you get this information from your optician to ensure the accuracy of your glasses. You may also measure your PD in front of a mirror, here we show how to do it.